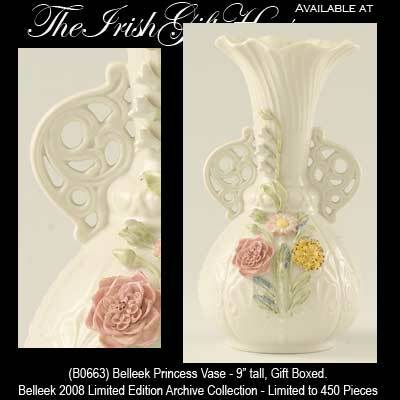 The princess vase is a flowered china design from Belleek. The 2008 Belleek Archive Collection is being introduced as part of the Pottery’s celebration of some of its finest historical pieces over the past sixteen decades. Each one of the pieces, such as the princess vase, represents a specific period within the Pottery’s history and celebrates the many hands that have forged the success of Belleek from its origins in 1857. The Belleek princess vase is a flowered sculpture with individually applied petals along with filigree handles. The fine china Belleek vase measures 9" tall and as part of 2008 limited edition archive collection it is restricted to 450 pieces.